Urban Pest Control provides pest removal services as one off treatments for the domestic sector including emergency pest control services and regular commercial pest control contracts for business premises. 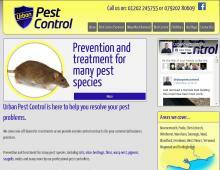 They currently offer pest control in Dorset covering the areas of Bournemouth, Poole, Christchurch, Ringwood, Verwood, Wareham, Dorchester, Blandford, Wimborne, Weymouth and Swanage. Urban Pest Control provides regular commercial contracts for pest preventative measures and pest extermination. They can be contacted for a no obligation free survey and quote. Pest Control Services are tailored to the customers needs and written reports are provided. Contact Urban Pest Control for all vermin control in Dorset including emergency pest control in Bournemouth, bed bugs in Poole, flea control, rat control in Dorset, pigeon & seagull control or wasp nest removal in Poole.